to Bob Ritter at the JM Center. Thank you. Current Location: Moved to the First Baptist Church at corner of 1st (US-550) and W. Oak Streets in November 2017. Comment: The Bloomfield Ten Commandments monument does not have anything to do with the Eagles Ten Commandments program. Kevin Mauzy, a former City Counselor, “was a primary instigator behind the installation of the Ten Commandments monument on the lawn of the City Municipal Complex.” (Complaint, p. 5) The monument is similar to Eagles monuments in that there is an eagle at the top, the mid-section contains an English version of the Ten Commandments and there is a scroll at the bottom identifying the donors (as “Private Citizens”) with a dedication date. The scroll falsely identifies the Ten Commandments as a significant contributor to “laws in our nation’s history”. In addition, the disassociation statement at the bottom is clearly intended to circumvent the Supreme Court’s decision in Pleasant Grove City v. Summum, 555 U.S. 460 (2009). (2) On September 9, 2003, Summum sent a letter to Duchesne City requesting a similar plot of land as that transferred to the Lion&squo;s Club in order to place a monument of its Seven Aphorisms in Roy Park. The city rejected Summum’ on October 27, 2003. Summum then filed a lawsuit on November 26, 2003. The lawsuit worked its way up to the Supreme Court along with Pleasant Grove City v. Summum, 555 U.S. 460 (2009). That case held that permanent monuments on public property were “government speech” which is not subject to First Amendment prohibitions. However, the Supreme Court did say that governments are still subject to Establishment Clause prohibitions. Duchesne City subseqently decided to move its Ten Commaandments monument to the City Cemetery in the spring of 2009 to avoid further litigation expense. U.S. District Judge Dale Kimball dismissed Summum’s lawsuit in July 2009. Location: Replacement monument in storage awaiting placement on the grounds of the Arkansas Capitol. Notes: On April 8, 2015, the Arkansas General Assembly passed SB939 -- The Ten Commandments Monument Act -- and Governor Asa Hutchinson signed the bill into law becoming ACT 1231. The law states the “placing of a monument to the Ten Commandments on the grounds of the Arkansas State Capitol would help the people of the United States and of the State of Arkansas to know the Ten Commandments as the moral foundation of the law.” The act also states “The placement of the monument under this section shall not be construed to mean that the State of Arkansas favors any particular religion or denomination over others” and requires that monument be paid for by private donations. The law requires Secretary of State Mark Martin to consult the Capitol Arts and Grounds Commission before approving the design and site for the monument. The law has prompted other groups to demand the state allow competing monuments, including a satanic statue. JM Center Comment: The statute falsely states that the Ten Commandments are the moral foundation of the United States and Arkansas. Importantly, the monument on the Arkansas Capitol grounds would definitely be an endorsement Christianity which the First Amendment prohibits. Location: Posey County Courthouse, 300 Main St, at the intersection of Main St. and Indiana-62. Comment: In March 2005, a vandal broke original 1956 Eagles monument at the Posey County Courthouse into three pieces. Posey Aerie No. 1717 took possession of the monument, restored and rededicated it – placing the monument on its front lawn at 109 W. Water St. Comment: Altho there is a striking similarity between the “Crump” monument and Eagles monuments, the JM Center is not aware of any connection between Ellen Phelps Crump and the Fraternal Order of Eagles. Donated by: Rep. Mike Ritze, a member of the Oklahoma legislature, and his family. Story/Litigation: The Ten Commandments monument was donated to the State of Oklahoma by Rep. Mike Ritze, a member of the Oklahoma legislature. Ritze intended the monument to look identical to the Eagles monument on the grounds of the Texas State Capitol hoping that the courts would find it to fall under the umbrella of Van Orden v. Perry (2005). American Civil Liberties Union of Oklahoma filed a lawsuit. An Oklahoma state trial court dismissed an Establishment Clause challenge to the Ten Commandments monument. The court in Prescott v. Capitol Preservation Commission, (OK Cnty. Dist. Ct., Sept. 19, 2014), noting that there are 51 other monuments on the Capitol grounds, held that “the Ten Commandments monument on the Oklahoma Capitol grounds is constitutional because of its historical value.” On appeal, the Oklahoma Supreme Court reversed. 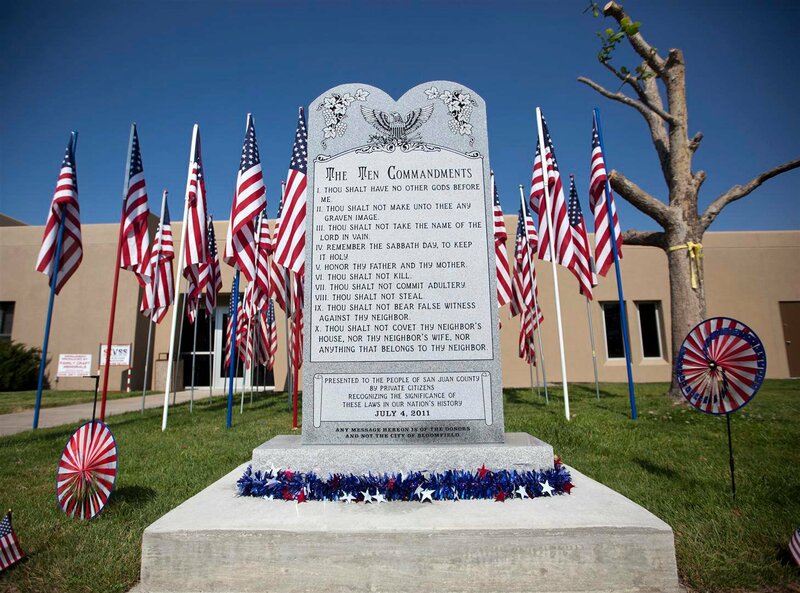 Prescott v. Oklahoma Capitol Preservation Commission, 2015 OK 54, __ P.3d __, (Okla., June 30, 2015) (Per Curiam) holding that the display of the Ten Commandments monument at the State Capitol violated the Oklahoma Constitution. In denying Oklahoma’s request for a rehearing (July 27, 2015), Justice Edmondson, concurring, stated: “:We have no embracing historical and secular context here. This isolated monument stating religious principles with religious symbols, without any other statements of secular historical relevance, and no proximate presentation with a common secular theme, compels my conclusion that it violates the Oklahoma Constitution, Article 2 § 5. The monumnet was subsequently moved to the Oklahoma Council of Public Affairs.